No, no, it's not drop dead; it's Dead Drop. A Dead Drop is a term from the world of espionage as Dead Drops--it's a way to pass info to another spy. Dead Drop has a lot going for it right out of the gate: It's a quick filler game designed by Jason Kotarski (of The Great Heartland Hauling Co. and Fidelitas fame), and it's being published by Crash Games, one of the most solid indie publishers in the industry. So how does it play? Is it worth playing? Here's our take. This is every bit a microgame. The components include 13 cards and 4 player-aid cards that contain nearly all the rules of play. We got a prototype that included one sheet of rules as well, so we imagine there will be something similar in the final product. The cards range in a value from 0-5, there are 4 - 0's, 3 - 1's, 2 - 2's, 2 - 3's, 1 - 4 and 1 - 5. The Drop is placed in the center of the table (1 card face down), and then The Stash is placed off to the side (cards equal to the number of players, face up), then the remaining cards are evenly dealt to the players. Then you're set to play! Swap the Stash--This is done by simply taking one card from The Stash and replacing it with a face-up one from your hand. Sell Secrets--The active player chooses another player, then secretly reveals 2 cards to that player. If the chosen player has a card in their hand that equals the summed value of the 2 revealed cards, they respond yes, and the players exchange cards (the card that equaled the value of the two cards, and one of the two shown cards). If the answer is no, then no cards are exchanged. At the end of their turn a player can attempt to pick up The Drop. To do this they have to make a guess at what the value of The Drop card is by placing two cards face-up that equal the value of their guess (the 5 card can be used as a 0 for this guess). Once they've placed their cards, they secretly look at The Drop. If they're correct, they win the round. If they're not correct, they're out of the round (in a 2-player game the other player wins the round). The first player to win 3 rounds wins the game! Jeremiah--This game showed up, and I was able to play it with a friend, sitting on the couch, in about 5 minutes flat. Not only were we playing it quickly but we were already enjoying the strategy of the different actions and deducing the next move. That's impressive! Firestone--Yeah, it's pretty easy to talk people into playing a game with only 13 cards. We jumped in right away. It even comes close to passing my wife's rules "requirement": she wants to only play games that can be explained in three or fewer sentences. There aren't many games that pass that requirement, but Dead Drop comes close! Jeremiah--The artwork is spot-on for the theme. It's bright, vibrant, and very secret agent-y. The cards are super functional, the top corner features the value of the card, but also has a number of crosshairs that lets you know how many of that particular card are in the game. That doesn't seem like a big deal, but when you're trying to keep track of what you've seen, and where, having as much information on the card is a really nice touch. Firestone--Yeah, the artwork is great. And all of the stretch goals on the Kickstarter campaign are for new deck designs--some of them look really cool. The game seems to scale well. When someone in a multiplayer game guesses incorrectly, it gives the next player a pretty big advantage, but it's not a big deal. Jeremiah Isley--I don't often fall in love with micro games, but I appreciate the gutsy move it is to design one, because there's no margin for error in your design. Dead Drop is dead on: great options on your turn, lots of deduction, and some bluffing and deception--all in a 13-card package. Bravo! Firestone--There's not much nuance in a microgame--it either works or it doesn't. Dead Drop works. It plays quickly, is easy to explain, and creates interesting decisions. And the whole game plays in 15 minutes or less. Dead Drop is a cool little microgame. 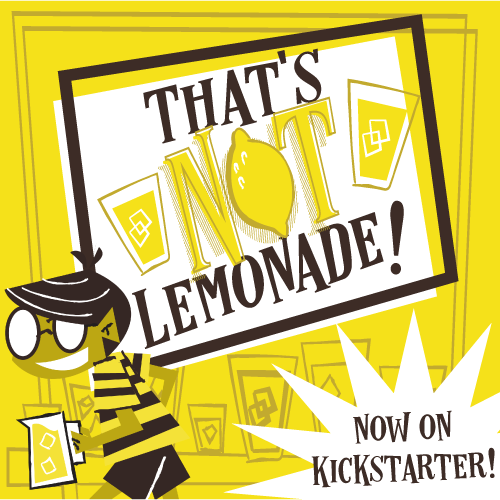 Check out the Kickstarter campaign here. And thanks for reading!